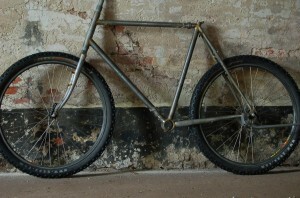 Dr Jekyll is a slighty too heavy commuter who is bored with riding to work every day, with his slightly too fat tyres and heavy steel frame. So one night he got naked, threw off his mudguards and tried on a couple of panniers…..
Once he’s wearing 10-25kg of panniers plus water, food and spare parts, and gets his eyes on a bad road or track he comes to life. A beast is awoken, a beast that just wants to move faster and further without a care in the world. Now that’s the travel companion I want to travel 25,000km through Africa with. 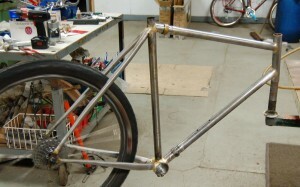 Frame: Reynolds 725 steel, with EBB for Rohloff and S+S for easy transport. Tires: 26×2″ Schwalbe Marathon supreme for onroad, Marathon XR /Extreme for offroad. Saddle: Brooks Flyer of course (needs a liter of sweat to brake it in, but after that its like a pair of old shoes). 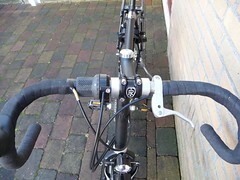 Handlebars: Nitto dream bar, modified with “M-gineering splitendz” to allow a Rohloff grip shifter on drop bars. Headset: Stronglight, good old fashion roller bearings instead of expensive well marketed crap. 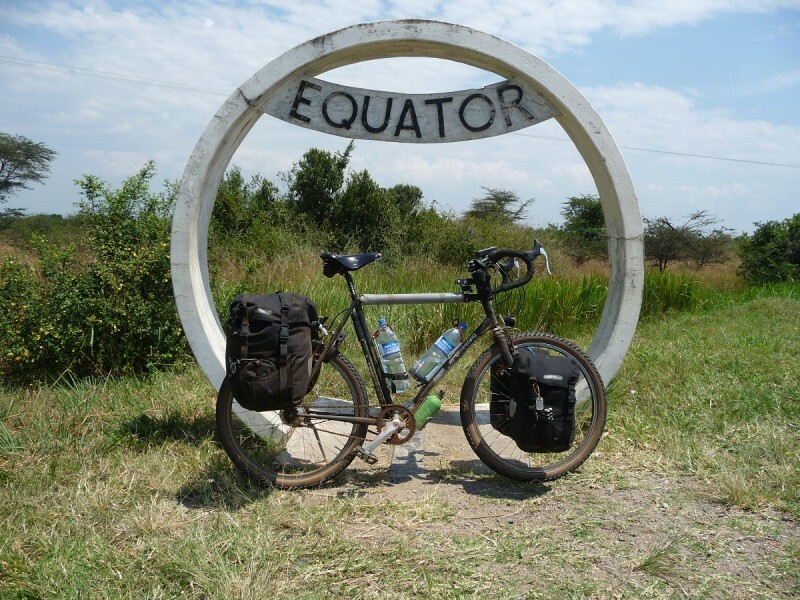 Transmission: Rohloff speedhub (EX), blackspire chain ring, 40×17 for Africa. Shimano LX/XT chain one of the few things Shimano is good at. Pedals: Wellgo platform pedals (means I can use my hiking boots/sandals on tour). Brakes: Shimano LX V-brakes, Diacompe 287V & pauls crosstops. Pump: Zefal hpx ( a full size pump, for the real work, no messing around with a little crappy pump that takes all day). Kickstand: Esge. A heavy extra, but makes life a lot easier. Thanks for taking the trouble to come over the mountain to spend time here. Safe travels and enjoy the rest of the continent. 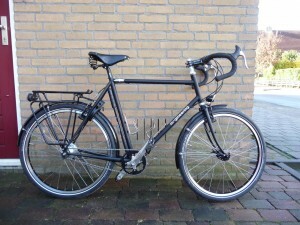 How did you solve the issue of the Rohloff with drop bars? 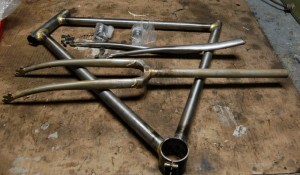 My frame builder solved it with his “M-gineering splitendz” which is basically chopping a set of drop bars in half then reinforcing them with bushes and clamps. Which works quite well actually. Another Q: Is that a secondary rear brake?